In this colourful psychological thriller for new adults set in the heart of England, Juliet discovers her sister Zoe has been captivated by the charismatic leader of a cult in a mysterious old manor house. A new copy of Mystical Circles paperback signed by the author. Usual Retail price: £8.99 plus £3.00 post & packing. SPECIAL OFFER £7.00 only with free post & packing. A new copy of A Passionate Spirit paperback signed by the author. Usual Retail price: £8.99 plus £3.00 post & packing. SPECIAL OFFER: £7.00 only with free post & packing. Want to know how to write a novel? Or perhaps you’re writing a novel right now and could do with some encouragement, friendly tips and motivation to keep going. And while you’re after that, how about discovering more about some of your favourite writers, their lives and works? Perhaps you just need inspiration and guidance. Inside this self help book, you’ll find nuggets and insights about such famous authors as JRR Tolkien, Jane Austen and George Orwell as well as unexpected help from people as diverse as Carl Jung, Ernest Hemingway and David Hockney. A new copy of Perilous Path paperback signed by the author. Usual Retail price: £4.99 plus £1.00 Post & packing. SPECIAL OFFER: £3.00 only with free post & packing. 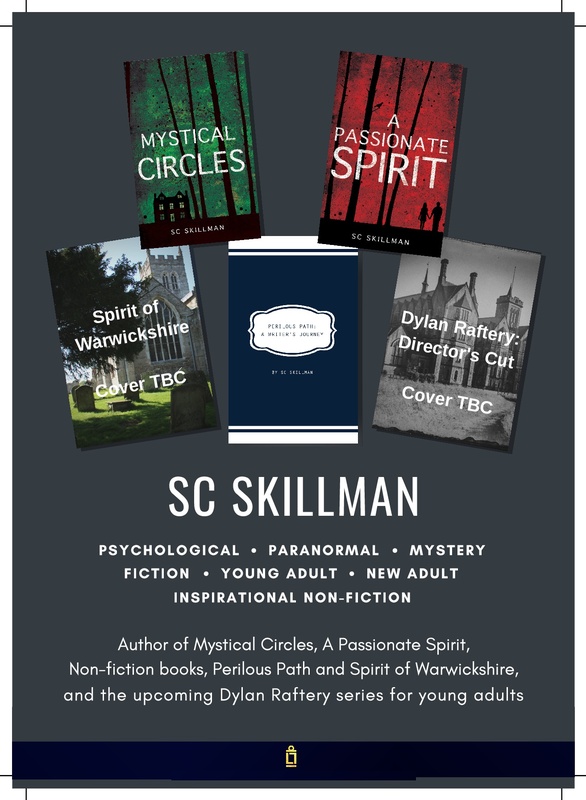 One new paperback copy each of Mystical Circles, A Passionate Spirit and Perilous Path, all signed by the author. Usual Retail price: £22.97 plus £5.00 post & packing. SPECIAL OFFER: £17 all 3 books with free post & packing.